Developed by English Electric during the late 1940s - essentially as a successor to the wartime de Havilland Mosquito twin-engine, unarmed, fast bomber concept - the Canberra can lay claim to being the first British jet-powered medium bomber when it was introduced in to RAF service in May 1951. Developed by English Electric during the late 1940s – essentially as a successor to the wartime de Havilland Mosquito twin-engine, unarmed, fast bomber concept – the Canberra can lay claim to being the first British jet-powered medium bomber when it was introduced in to RAF service in May 1951. The Canberra became the first jet aircraft to make a non-stop transatlantic flight and amongst the performance requirements for the type was the demand for a high altitude bombing capability in addition to flying at high speeds, and in February 1951, and throughout most of the decade, the Canberra could fly at a higher altitude than any other bomber or even any other aircraft, establishing a world altitude record of 70,310ft in 1957. The Canberra proved to be a highly adaptable airframe, and following the entry of the Vickers Valiant, the first of the trio of V Bombers in to RAF service in 1955, (see Flight Craft 7 ‘Valiant, Victor and Vulcan’) which were capable of carrying much heavier weapon loads (including nuclear weapons) over longer ranges, the Canberra continued to serve in a variety of varied roles including tactical nuclear strike, low-level strike and ground attack in its B(I).6 and B(I).8 variants, photographic and electronic reconnaissance platform in its PR variants, multi-task training aircraft and inevitably its invaluable service with specialized MoD Test and Evaluation units. Serving in all the RAF’s Theatres of Operations including the UK, the Middle and Far East and RAF Germany, the RAF continued to operate the Canberra for 50 years from the Suez Crisis in November 1956 to its service in Afghanistan in June 2006. The Royal Navy’s Fleet Air Arm also operated Canberras, initially as radio controlled target drones and later by the Fleet Requirements Unit. 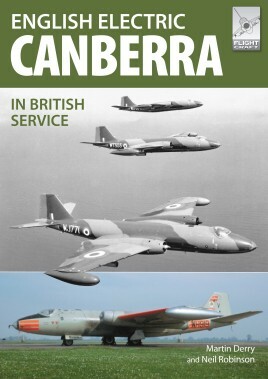 Although outside the scope of this particular title, it is of interest to note that the Canberra was a significant aircraft on the export market, being operated by the air forces of many nations and was license produced in Australia and the USA.